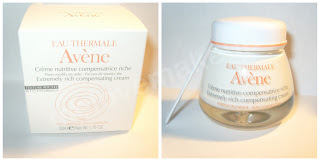 Sophsterlicious • UK Blog: Avene Extremely Rich Compensating Cream. Nourishing care for dry sensitive skin. Formulated with plant-based active ingredients, this cream is ideal to make up for lipid deficiency and restore skin’s natural protective barrier. Moreover, skin is protected against external aggressions thanks to Pretocopheryl which protects the skin against the skin ageing effect of free radical. The Rich Compensating Cream, with a smooth and rich texture, nourishes and moisturises the skin which, day after day, recovers its comfort, suppleness and radiance. Paraben-free. First off, this cream is designed for people with dry/sensitive skin. My skin is a little dry in places but not overly so, however when I began using this we were still in the middle of freezing cold weather and my skin was a little more dry. This cream comes in a cute little glass jar and there is also a spatula in the box to use rather than dipping your fingers into the jar, I like the idea of the spatula, because I can take just the amount I need and put it on the back on my hand and apply it with my fingers. It has a light scent that is really subtle and not offensive at all and the cream itself is a super thick 'rich' consistency, hence the name 'rich compensating cream' I guess! It is super thick but warms to your finger tips and just melts and blends into the skin really nicely, you don't need to use alot to cover your face and neck either because it really spreads out well. When this is on the skin it feels really soothing and completely hydrating, like nothing else that I have ever used, which is why it will be so good for very dry skin. It makes my skin feel so soft and moisturised and I feel glowy and fresh faced after I use it. One this I will mention is that it says you can apply in the am and the pm, I tried this when I first got it, but felt the cream was too heavy on my skin for the morning, and applying my make up on top just felt a bit wrong and I could still feel the cream on my face. It doesn't leave a greasy feeling on my skin, but I was just aware when I tried to apply face make up that it hadn't all sunk in yet. So, I opted for just using it in the evening before bed, That way it has all night to do it's work and I wake up with smooth refreshed skin. I would most definitely recommend this for people which sore sensitive dry skin, I really think it will work wonders. It has removed all dry patches from my face and was a great help in the cold snowy period we had. Boots Online - Click here. See the Avène website here.